Platelets are small cells in your blood that your body uses to form clots and stop bleeding. If you have too many platelets or your platelets stick together too much, you are more likely to form clots. This clotting can take place on the inside of your arteries and lead to heart attack or stroke. Antiplatelet drugs work to make your platelets less sticky and thereby help prevent blood clots from forming in your arteries. Aspirin is an antiplatelet drug that may be used. P2Y12 receptor blockers are another group of antiplatelet drugs. This group of drugs includes: clopidogrel, ticlopidine, ticagrelor, prasugrel, and cangrelor. Prevent heart attack or stroke for those with PAD. Clopidogrel (Plavix, generic) may be used in place of aspirin for people who have narrowing of the coronary arteries or who have had a stent inserted. Sometimes 2 anti-platelet drugs (one of which is almost always aspirin) are prescribed for people with unstable angina, acute coronary syndrome (unstable angina or early signs of heart attack), or those who have received a stent during PCI. For heart disease primary and secondary prevention, daily aspirin is generally the first choice for antiplatelet therapy. Clopidogrel is prescribed instead of aspirin for people who are aspirin allergic or who cannot tolerate aspirin. Clopidogrel and aspirin is recommended for people who are undergoing angioplasty with or without stenting. Prevent or treat heart attacks. Prevent clots from forming inside stents put inside your arteries to open them. After bypass graft surgery that uses a man-made or prosthetic graft performed on arteries below the knee. Your health care provider will choose which one of these drugs are best for your problem. At times, you may be asked to take low dose aspirin along with one of these drugs. You have bleeding problems or stomach ulcers. You are pregnant, plan to become pregnant, or are breastfeeding. Ticlopidine may lead to a very low white blood cell count or an immune disorder that destroys platelets. Ticagrelor may worsen kidney function and cause episodes of shortness of breath. This medicine is taken as a pill. Your provider may change your dose from time to time. Take this medicine with food and plenty of water to reduce side effects. You may need to stop taking clopidogrel before you have surgery or dental work. DO NOT just stop taking your medicine without first talking with your provider. DO NOT take other drugs that may have aspirin or ibuprofen in them before talking with your provider. Read the labels on cold and flu medicines. Ask what other medicines are safe for you to take for aches and pains, colds, or the flu. If you have any type of procedure scheduled, you may need to stop these drugs 5 to 7 days before hand. However, always check with your provider first about whether it is safe to stop. Tell your provider if you are pregnant or planning to become pregnant, or breastfeeding or planning to breastfeed. Women in the later stages of pregnancy should not take clopidogrel. Clopidogrel can be passed to infants through breast milk. Talk with your provider if you have liver or kidney disease. Take it as soon as possible, unless it is time for your next dose. If it is time for your next dose, take your usual amount. DO NOT take extra pills to make up for a dose you have missed, unless your doctor tells you to. Store these drugs and all other medicines in a cool, dry place. Keep them where children cannot get to them. Abraham NS, Hlatky MA, Antman EM, et al. ACCF/ACG/AHA 2010 expert consensus document on the concomitant use of proton pump inhibitors and thienopyridines: a focused update of the ACCF/ACG/AHA 2008 expert consensus document on reducing the gastrointestinal risks of antiplatelet therapy and NSAID use: a report of the American College of Cardiology Foundation Task Force on Expert Consensus Documents. J Am Coll Cardiol. 2010;56(24):2051-2066. PMID: 21126648 www.ncbi.nlm.nih.gov/pubmed/21126648. Fihn SD, Blankenship JC, Alexander KP, et al. 2014 ACC/AHA/AATS/PCNA/SCAI/STS focused update of the guideline for the diagnosis and management of patients with stable ischemic heart disease: a report of the American College of Cardiology/American Heart Association Task Force on Practice Guidelines, and the American Association for Thoracic Surgery, Preventive Cardiovascular Nurses Association, Society for Cardiovascular Angiography and Interventions, and Society of Thoracic Surgeons. Circulation. 2014;130:1749-1767. PMID: 25070666 www.ncbi.nlm.nih.gov/pubmed/25070666. Goldstein LB. 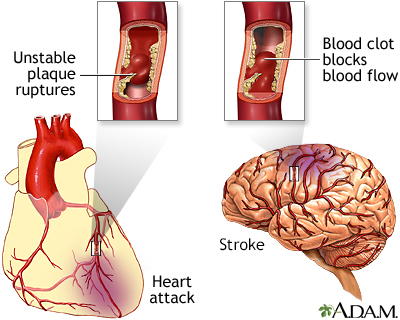 Prevention and management of ischemic stroke. In: Zipes DP, Libby P, Bonow RO, Mann DL, Tomaselli GF, Braunwald E, eds. Braunwald's Heart Disease: A Textbook of Cardiovascular Medicine. 11th ed. Philadelphia, PA: Elsevier; 2019:chap 65. January CT, Wann LS, Alpert JS, et al. 2014 AHA/ACC/HRS guideline for the management of patients with atrial fibrillation: a report of the American College of Cardiology/American Heart Association Task Force on Practice Guidelines and the Heart Rhythm Society. J Am Coll Cardiol. 2014;64(21):e1-e76. PMID: 24685669 www.ncbi.nlm.nih.gov/pubmed/24685669. Mauri L, Bhatt DL. Percutaneous coronary intervention. In: Zipes DP, Libby P, Bonow RO, Mann DL, Tomaselli GF, Braunwald E, eds. Braunwald's Heart Disease: A Textbook of Cardiovascular Medicine. 11th ed. Philadelphia, PA: Elsevier; 2019:chap 62. Meschia JF, Bushnell C, Boden-Albala B, et al. Guidelines for the primary prevention of stroke: a statement for healthcare professionals from the American Heart Association/American Strok Association. Stroke. 2014;45(12):3754-3832. PMID: 25355838 www.ncbi.nlm.nih.gov/pubmed/25355838. Powers WJ, Rabinstein AA, Ackerson T, et al; 2018 Guidelines for the early management of patients with acute ischemic stroke: a guideline for healthcare professionals from the American Heart Association/American Stroke Association. Stroke. 2018;49(3):e46-e110. PMID: 29367334 www.ncbi.nlm.nih.gov/pubmed/29367334. A heart attack or stroke may occur when an area of plaque (atherosclerosis) ruptures and a clot forms over the location, blocking the flow of blood to the organ's tissues.